I don’t know why, but it’s the little things that make me happiest. Like when a certain coffee chain switches the color of their cups to red. Now I can’t wait to see what fun thing they’ve come up with to hold a gift card. Can anything possibly top the one from last year? Am I the only one in the world that gets excited by little things like this? This entry was posted in Family, It's all about me!, NaBloPoMo, Random stuff. Bookmark the permalink. I just got my first one of these yesterday. I agree. It’s the little things that make me smile 🙂 I always love their in store decorations as well. They are usually minimal but totally gorgeous. I agree! Let’s go play. Curse you for ever mentioning the salted caramel hot chocolate! I can now guiltlessly blame you for the extra 497 pounds I gained yesterday! Hmmm. We were at Starbucks on Saturday and received the plain old cups. Now I guess I’ll have to go back. I do love little things like that. well i would be happy to just have a cup of coffee at stage of the morning! It sure dosen’t take much to make you happy Sue! What gift cards are you talking about! Well get that girl to make you a cup. You have to follow the link to see the gift cards…they were from last year and came in the most adorable mitten. My favorite thing is when they have their holiday open house and you can order any drink for free. That has to be the happiest time of year…..
Really? How come I don’t know about this? Tell me more!!! LOL…..it’s the little things for sure! Who needs fancy expensive stuff when there are Red Cups out in the world? My little love of the day today is my $1 “bottle” of N.Y.C. “long wearing nail enamel” # 133A called Purple Pizzazz Frost. It’s a nice intense purple. Trouble is it won’t dry and so I can’t “DO” a whole lot. Due to budget constraints, I have given up my daily latte for a time. It’s killing me. It’s a rarity for me to get a latte. I’m still working on the $50 gift card that someone gave me last Christmas! The red cup makes my day too. Although I’ll probably only give in and buy one caramel macchiato this season. When I’m out Christmas shopping on only one day, which happens to be my birthday. This is also when I give in and by myself a box of See’s candy. If I can’t get it done on that one day, I go internet shopping. I really hate the crowds around the holidays. Starbucks is a treat. I told the manager of my local Starbucks about the Starbucks Christmas tree I made. I might send a pic to headquarters. I can’t wait to see the gift card holders and the ornaments. 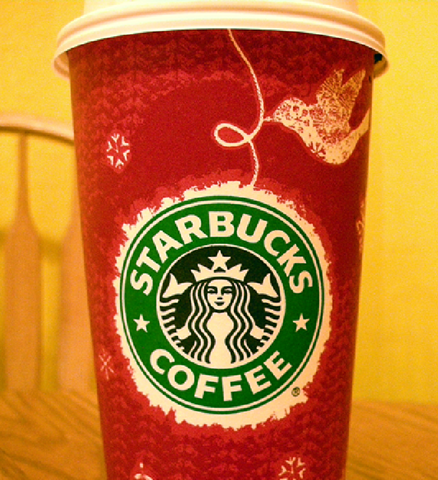 I get all misty-eyed when the red cup comes back. Love love love me some peppermint mocha! Thanks for the reminder, I’ll have to get one this week.